Every neighbourhood in Bengaluru (India) is trying its best to manage its own waste. They in their own way are setting precedents. Earlier, we read about HSR Layout and the adventures of HSR Layout Citizen Forum to create a ‘Zero Waste Community’. In the current post, I will be taking you to ELCITA, an acronym for Electronic City Industrial Township Authorit. ELCITA provides for the infrastructure and service needs of the Electronic city. The electronic city is a specially allocated area for spurring industrial growth, home to 158 companies, spread across more than 903 acres. According to Solid Waste Management (SWM) Rules 2016, all local bodies, even industrial townships must manage their waste in decentralized and scientific manner. ELCITA has tendered out its waste management services to Hasiru Dala Innovations (HDI), a social enterprise working in waste management and focusing on securing livelihoods of waste-pickers. HDI won the tender to provide waste management services earlier this year and is providing waste management services to ELCITA since May 2018. HDI collects segregated waste from 90 companies and provides waste management services on a user-pay model: pay as you throw/generate. HDI is authorized to collect food waste, dry and garden waste. It is receiving 3 tons of dry waste, 1 ton of food waste and half a ton of garden waste, plus less than a ton of mixed waste (reject waste). The dry waste is sent to the facility set up by ELCITA. Food waste is being sent to composting and biogas facility. In future, some it will be processed in the ELCITA waste management facility. The garden waste is given to a farmer, who composts it and use it for farming. The details of the facility are provided below. ELCITA has set up an elaborate waste aggregation and sorting centre, spread over less than an acre of land. It is operated by HDI. Currently, it houses a dry waste sorting facility: Hopper (to pump in the dry waste on the conveyor belt uniformly), conveyor belt and aggregation sheds. The sorters sit next to the belt and pick up the material, according to the different categories and place it in the bins based on the categories: paper goes in the bin of paper, carton boxes in the bin of carton boxes, hard plastic in the bin dedicated to hard plastic. The dry waste is sorted in more than 20 categories. Later stored in the allocated sheds till the buyer from recycling industry trucks it away. To give an illustration, the sorted tissue papers are sent to paper mills. Similar supply chains exist for other recyclable material. In dry waste, multi-layered plastic is also received. In the absence of any sustainable facility, it is sent to cement plants for co-processing, as per the prescription in the SWM Rules 2016. The facility has space for composting food waste. It is under renovation, once up and running, it will convert 400 kilograms of food waste in compost, particularly, vegetable peels and citrus fruits as the current bio-methanization plants cannot absorb them. There is space allocated for electronic waste aggregation. Its collection, aggregation and disposal are contracted out to 4R Recyclers by ELCITA. The facility also receives mixed waste, termed as reject waste. The mixed waste includes wet and dry together and some amount of sanitary waste from the small eateries. Earlier the facility was receiving around 2 tons of such waste, now it is less than a ton. The reduction in receipt of mixed/reject waste was possible due to continuous efforts by HDI team. They kept on insisting on picking up ony segregated waste and informed all the waste generators about the ways to do segregation. The mixed waste is being sorted and then sent to respective units for processing or aggregation. 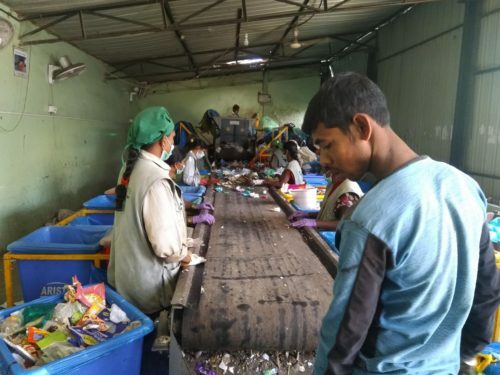 HDI is pursuing the waste generators to ensure segregation at source and in future, the mixed waste collection and sorting will be completely phased out. Most of the dry waste received in the facility is low-value material, thanks to the efforts in aggregation and sorting, even low-value waste is going for recycling. The facility plus waste collection service employs 29 workers 1 manager and 1 supervisor. Some of the workers are erstwhile waste-pickers. The minimum salary paid to any employee (in this case: the sorters) is INR 12000 plus all the benefits which an employer needs to contribute as per the labour laws. The waste collection starts at 5 o clock in the morning and concludes at 5 in the evening. The waste collection is done by 3 trucks. Majority of the waste collected is dry, therefore, it is voluminous. When the truck gets full, they come to the facility and unload the waste and go for collection again. In a day, 6 tons of waste is collected, in 3 shifts by each truck. The time of operation of the facility is 9-5 when the waste is sorted and aggregated. With all required technology and workforce in place, the ELCITA waste collection and management facility operated by HDI is an ideal of sorts for our cities. It provides employment. It ensures 100 percent collection and makes the waste destination bound.